The Majestic Rollerball Pen offers pen aficionados distinctive style and flair in a collector’s grade pen. Its regal profile is accented with brilliant 22kt Gold plating on all components which showcases a sparkling Swarovski clear crystal on the clip.The body is handcrafted out of select Exotic Woods and highly polished to a sleek and smooth finish.The accents rings, bands and caps are custom casted using 3D raised designs and of course the refill inside the pen is a Schmidt ®.When you’re looking for the best – select one of our Majestic Pens to make your collection complete! Available in both Black Titanium or 22kt Gold plating. Our ink pens are handmade from one of over sixty hardwoods from around the world. 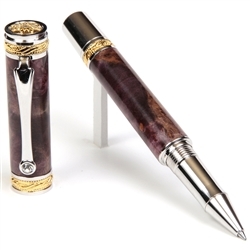 These exotic woods give your pen a look of its own, no matter if the wood is from the outback of Australia, jungles of Asia, frontier forests of the United States or plains of Africa. Hand turned and hand polished, your pen will have a permanent gloss finish adding to the rollerball pen’s durability and long use. The Majestic Rollerball pen features a perfectly balanced writing experience. The cap is removable and screw's on to the front of the pen and is not intended to be posted on to the end. We have also enhanced the beauty of your ink pen by using Black Titanium or 22kt Gold plating with Rhodium accents for added durability. If you’d like to personalize your Majestic Rollerball Pen for yourself or as a gift, you can also have your pen engraved, in addition to a beautiful gift box available in either Maple or Rosewood. 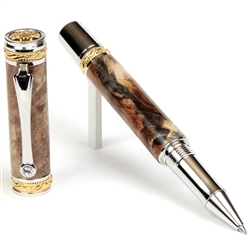 You can also order a matching Fountain Pen to make your gift or collectible even more special.